Fans of Robin Hood have an ongoing debate about the hero’s political inclinations. Some point to Robin’s stance against unjust taxation and his work to restore government to how it had been -- clearly showing him to be a conservative who would be right at home in the modern Tea Party. Others claim Robin’s “rob from the rich and give to the poor” actions clearly mark him as a Socialist. 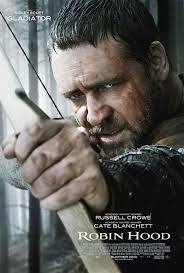 Ridley Scott’s 2010 version of Robin Hood certainly belongs in the latter camp. 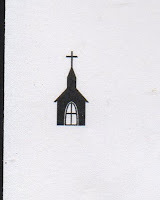 However, our concern at this blog is religion rather than politics, and this film’s attitude toward the church might be characterized as closer to Communist perspective. He is thrown in the stocks along with Allan A’Dayle, Will Scarlet, and Little John, but when the King dies while attempting to loot a French castle, Robin and his comrades escape and return to England. But Robin has one more duty to perform left from his time abroad. He promised the dying Sir Robert Locksley that he would return the Sir Robert’s sword to his father in Nottingham. Robin impersonates Robert to gain access to Sir Walter (Max von Sydow), the dying father. Robin is surprised when he is asked to continue to impersonate Robert, so that the newly crowned King John (Oscar Isaac) will not gain title to Sir Walter’s land. When the Bishop’s men come to collect the grain, Robin blackmails Tuck into giving the grain to him, telling him that otherwise he’ll inform the Bishop about the Friar’s profitable winemaking. Tuck succumbs to the blackmail, and aids Robin in returning the grain to the people of Nottingham. The major conflict in the film turns out to be quite different than in other Robin Hood films: the French want to invade England. Friar Tuck is actually one of the first to be aware of the invasion, when an expeditionary force of French soldiers steal his barrels of wine. King John finds he needs the support of all of England to oppose the French, so he promises to change his oppressive policies. And all of England comes together to drive back the French. Not only does Robin join the battle, but Marian does as well, fighting the French on the shore. But after the battle is won, King John reneges on his promises and claims “God made me King,” and says he will take whatever he wants from the people. The film ends with Robin retreating to Sherwood Forest with his Merrie Men and Women to establish a commune, free from the oppression of the monarchy and the church (though Friar Tuck joins them). A title card reads, “No tax, no tithe, nobody rich, nobody poor, all sharing at nature’s table.” Perhaps we could say Robin is a part of the Green Party. The film ends where most Robin Hood films begin with Robin and his band in hiding. The Church in this film is a wealth-grabbing institution in competition with the monarchy to steal the most from the people. 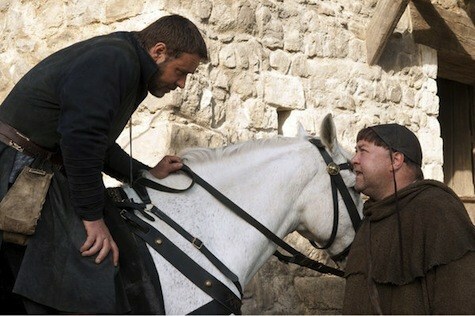 Even Friar Tuck only does good when blackmailed into doing so. So the church in this Robin Hood earns our lowest rating of One Steeple. Bonus Robin Hood: I’d like to point out one Robin Hood that is free of the ideological debate about the politics is found in the fantasy/time travel film Time Bandits. In that movie, John Cleese plays a Hood who is just a hood. He robs from the rich and the poor to get stuff. He just has a really good PR agent. Robin Hood Month: In Theaters Now!